21030402 - Bought from JD Music in the Philadelphia area for $300. It didn't work. So, I bought another, hoping to interchange the parts to make one good one. 21030399 - Bought from J. Lewis in Baltimore. This unit also had problems. I believe I paid $400. 21030100 - I bought this unit from someone in California about 2 years ago. I believe he had two for sale at the time, one good one and one for parts. I bought the one for parts. It was missing the I/O board and computer board, but had everything else. I restored this particular unit, refinishing the wood, put in a new power supply with new circuitry (not Tillman's) and it works great. Expander - I haven't been able to find the Serial # on the expander, but I haven't looked that hard yet either. It's not on the outside where it should be. Anyone know where to look inside? When I find it, I'll provide the number. I bought this unit from M. Smith in Oklahoma for $350. I have also obtained 2 additional I/O boards and a computer board. One I/O board and computer board came from a guy in London, Ontario, Canada. I don't recall his name. The other I/O board I think I bought from somewhere on the east coast, but from whom or where escapes me. Someday I'll put all this stuff back on the market. I hope to at least get one more unit up and running, then will probably let the other one go with parts. I'm finally getting around to registering my Chromas. I have 3 Chromas and 1 Expander that I have bought over the last five years. I'll list them in the order of purchase. Thanks! These will be in the new site, which is getting pretty close to done. Expander - I haven't been able to find the Serial # on the expander, but I haven't looked that hard yet either. It's not on the outside where it should be. Anyone know where to look inside? See FAQ: Where do I find the instrument serial number? Hell - those prices are really disgustingly cheap! Seems to me the Chroma prices on PrePal's Rhodes page are low. I wonder where they get their data. Once every night, the PrePal service goes out and retrieves any new items from several sources, including news groups (NNTP), auction sites, music sites with used gear boards, etc. After it creates a list of what it thinks could potentially be music items for sale, it tries to eliminate duplicate entries (ie; someone posting a forsale post on two different newsgroups, or on the newsgroups and a message board as well). After it's satisfied with the intermediate data, it attempts to identify manufacturers as well as products; if it's finds a sufficiently accurate match, it's added to the products entry in the database. Good for you - to me one chroma is enough though and I still consider mine a bargain. I paid about $3400.00 US for my first Chroma when new, and $110.00 for the second. ... I think of them both as "good old days", albeit one was a bit older than the other. I recently sold my Chroma and have extra parts left over that the buyer wasn't interested in. I was actually trying to acquiring enough parts to build another complete Chroma, but I never found a case or power supply, so I've decided to sell the remaining parts. (6) Voice cards. I tested these and they work fine. One of them has the ARP logo. Asking $95 each. (2) Voice cards. These tuned up fine and seemed functional, but they wouldn' t track the pitch properly over the entire keyboard range. Whenever they were played in unison with other cards they would be slightly off in pitch as you deviated from middle C. Asking $70 each. (1) Motherboard. This one is dead. It's complete, with a full set of R14 eproms. It originally had some battery acid damage, and I replaced some sockets, but that didn't help. All socketed parts have been tested good. Asking $65. A full set of keys. In great shape and uniform in color. I'll only ship these within the US. Make me an offer. I think that I also have a transformer and a handful of other boards, but I can't find the box I stored them in. I'll list those items when I find them. Shipping is extra. I'll ship within the US via priority mail, and to Canada and Europe via Global Priority Mail (airmail). I won't ship anywhere else. I'll charge whatever the US mail website comes up with for your address. Payment is accepted through Paypal only. I've described everything as best as I can, but everything is sold as is. First come, first served. My ebay username is 'arti' if you need a reference. And yes, whatever is left over after a week or two goes on ebay. Does anyone have a Chroma I/O board for sale? Mine's not working and I want to swap it out. Just got my Chroma up and running... bought it several years ago working and it died after a couple of months. Just swapped the I/O board and all is well again. I am now getting this message after autotuning " ERR 4". Does this mean voice 4 is not being tuned properly? All voices sound like they are in tune. I am now getting this message after autotuning " ERR 4". Does this mean voice 4 is not being tuned properly? All voices sound like they are in tune. Well then, doesn't the chroma automatically "shut down" the non-tuned voice like many other polysynths? Or do you really have all 16 tuned? Not sure if the voice disables automatically, but that would explain why it's in tune. I turned it off for awhile and then back on for another hour and had no more error messages, so I guess the tuning is on the margin like you said. But it sure sounds great to me! I'm not going to worry about it, I'm just happy to have it running. if i recall correctly, the defectious voice is switched off. but with one of the setsplit commands you can switch it on again to experiment. just check in the service manual. yes this is true. The board which cannot be tuned are switched of. There is hidden command (check the service manual) to switch on even the voice cards which could not be tuned. Also there is a manual tuning procedure described in the service manual to bring back the "out of tune" boards if there is no hardware fault. By the way, as I noticed, the tuning sometimes might depend on temperature and humidity. So sometimes it helps to run the Chroma for about 10 minutes and tune it again. Just got my Chroma working after years of being broken and it works fine now. I have a JL Cooper Chromaface that came with the unit and I've never used it. I powered the Chroma and the interface off, plugged them both in and fired up the Chroma. It goes through the autotune routine (lights flashing) then... nothing, no display, no sound, no buttons work, the machine crashes. If I power it off, disconnect the Chromaface and reboot, it comes up fine. I tried to boot it several times with and without the interface and the behavior is consistent. I'm guessing the easiest things to check/most likely suspects are the power supply and ribbon cable for the Chromaface. The cable is a flat grey ribbon cable, can I just replace this with a standard parallel DB25 cable like the Moog Voyager uses to the breakout box? Any other advice is appreciated. Also, I was thinking about just replacing it with a Chromacult interface. Would this be worth the extra money, or is the Chromaface worth salvaging? I think the Chroma Cult is a worthwhile investment. It's a far more capable interface (see the manual), and is the standard--most of the Mac/PC software available for the Chroma assumes or requires it. Would it be safe to try a standard DB25 parallel cable to see if this is the culprit? I'm going to get a Chromacult anyway, but want to use it w/ midi in the meanwhile. I don't know as mine are built in. I will look later tonight when I am at the studio, but if I remember correctly I think it is a straight crimped cable. I have have Chromacult interfaces on a couple Chromas - but I too have kept the JL Cooper box (for when I really don't need to do the sysex dump/CC work. If money isn't an issue - then I'd certainly look at the Chromacult. If the budget is tight (and/or non-existant) I'd say poke at the JL Cooper interface a bit more (you've already got it - so it can't hurt to fiddle a bit). Is the power adapter for the Chromaface OK? (I'm not sure how it would behave it was connected to the Chroma with no power asserted ... mine has been modified to pull power directly from the Chroma instead of getting it from an external cube). If there is a SC it could very well behave like that and yes, a new cable _may_ help, but not if the problem is in the chromaface. This looks to be S/N 21030668 (listed in the registry). See the registry entry for pictures. I found three more chroma boards that I'm putting up for sale. IO board in full working order, comes with solenoid assembly and slider cap, asking $100. Channel motherboard, works fine, no bent or missing pins, asking $65. EQ board with slider caps, functionality unknown but looks good, asking $35. Shipping is extra. Thanks to all of you who bought parts from my first post. Item 3769619247. A rough translation of the description: "For sale, one of eight voice cards, taken from a fully functional Chroma. Delivery to commercial users under exclusion of the liability for material defects. Photo on request." Well I pulled by Chroma out of Storage this week to get it in the studio and in use if possible. After a year or so in storage, (standing up-thx allot wife! : ( ) Its about 85% functional!!!! I think thats very good?? Voice boards 4, 5 & 7 Error upon auto tune and boot up. I am guessing that when I open the unit this weekend they just need to be re-seated and the board contacts cleaned ? and I hope to get 6 or 7 good voices at least. **What should I use to clean the board contacts? Is Caig Detoxit Ok or just Iso alchohol ? I have 4 keys not working (The 3 top most d's and final g), despite exercising them as much as a I can (I got two to work this way) and will clean the contact this weekend. **Could someone tell me the correct procedure for cleaning contatcs again. It has been so long. The battery seems good. I loaded some factory banks and all was well (Thx Olli!!). I am now going through all the sys ex file patch banks and picking my favorite. If your on Mac OS X, Snoize works great and is free here: http://www.snoize.com/SysExLibrarian **Does anyone have any favorite bank to work off of or play with ??? The Syntech Midi box Ken sent me last year works great. In January, a friend will be refinishing mine a natural/light oak type look/finish for me. **Could someone tell me what type of finish I want to use ? Overall , Im very happy to have the Chroma back in my rig. It has some very fat sounds and nice basses too. Not as good at pads or strings as I hoped, but ooh well. Thank you to Chris ands Olli for there recent help and Advice. The new site, which includes the 2004 archives, is almost ready to go; there is just a pesky CSS layout problem (actually a bug in IE/Windows) I'm working on. I hope to post a "beta" in the next few weeks. Here are my tech notes from today. I have a fully functioning 8 voice Chroma now!! : ). looking forward to the new finish in January, adding a Cv pedal, and getting a solid tabel stand to hold it. I pulled the Rhodes Chroma out. It had 3-4 voice boards booting up in error and 5 or 6 keys not triggering and the memory was gone. Replaced double A battery in Chroma, and loaded new sound bank through snoize midi sys-ex librarian. snoize.com/SysExLibrarian/ Went through about 100 sysex banks of sounds from Chris' website in the morning and settled on the Synasty3 set to work off. Really had forgotten how FAT and BIG the Chromas is, great for bass!!!!! Found a few nice pads in this set to help me. Nice percussive and bandwidth type sounds. cleaned all key contacts (3 strips of silver for each key), a couple still stubborn keys, bent the contacts to let them touch easier when key press. Fixed! A few keys are still iffy, but the more the board plays the better it gets. January a friend will refinsih all the wood for me in natural stain and wax. Should be fun!!! This thing is Supa Fat! Not great for pads but for basses and nice filter sounds and percusssive stuff. Nearer the Ob Xpander IMO. More here: [see Reviews for the current URL]. Thx to JL and Juilie Yarbrough for tech notes regarding the problems. Thx to Olli and Chris for other help. Thx to Ken Y for the midi interface! Thx to David Morley for talking about his Chroma. I hope you get another one day. I would like to add a CV pedal to the Chroma, I do not have the origional. Mike Peake promised to send it, but it never came. The Roland EV-5 looks like it will work but is there something better out there thats not hard to get? 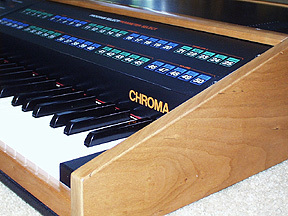 I would like to get a more natural light finish similiar to Don Tillman's Chroma seen here: http://www.till.com/articles/ChromaPowerSupply/images/side-panel.jpeg Don, used Varathane Diamond finish any other suggestions for getting this type of finish ? Any tips on getting a Key Follow effect despite there not being one on the Chroma ? What is a good way of assembling/organizing user banks? 69 euro or 75 as buy it now... I don't know with rev it is though.